The air conditioning system in your car is nothing more than a heat pump. 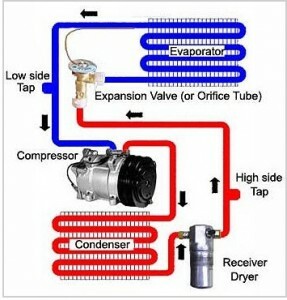 Low pressure vapor leaves the compressor as high pressure vapor; the condenser removes the heat from the high pressure vapor and becomes a high pressure liquid. From here it will pass through an orifice/expansion valve to reduce the pressure of the liquid to pass through the evaporator. At this point, the vapor becomes very cold. The cold air passes through an accumulator then back to the compressor to begin the entire cycle again. Your system will either have a drier after the condensor or an accumulator after the evaporator. A drier system uses an expansion valve and an accumulator system uses an orifice valve. Generally, if there is a problem with your condensor, it may be best to have it replaced, rather than opting for the less expensive flush. Be certain to replace your condensor with an equivalent model as they are not all created equal! Rest assured that Everett Air Conditioning Service only uses parts manufactured specifically for every car they service. Occasionally, you may develop a freon leak in your air conditioning system. That being the case, your mechanic will check for oil leaks as well. It is essential that a leak be repaired to eliminate freon leaking. When replacing freon, never mix types! 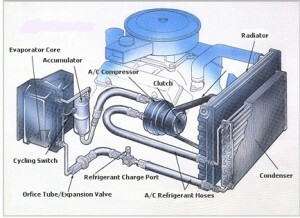 Other problems you may encounter with your car’s air conditioning is compressor failure. This a replacement that should be done by a certified mechanic.